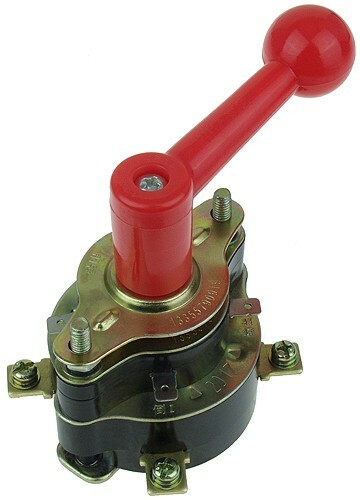 Heavy-duty motor reversing switch for electric scooters, bikes, ATVs, go karts and other small electric vehicles. The dimensions of this switch including the selector knob are 3" high x 2-1/4" wide x 2-3/4" deep. Three position switch has reverse (left), neutral (center), and forward (right) positions. Selector knob is removable for panel mount installation. Selector knob shaft has a 6mm outside diameter. Mounting tabs have a 5mm space between teeth and work with a #10 or 5mm screw or bolt. Wire terminal mounting screws are 4mm and work with #8 ring terminals. This is the OEM reverse switch found on many four wheel electric quads and all terrain vehicles. Rated for DC motors 2200 Watts and under. Wiring directions and mounting information for this switch are available below. 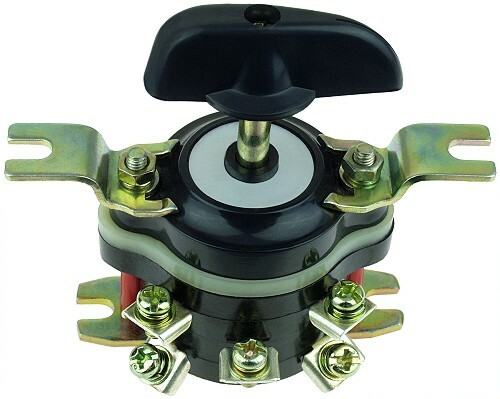 Heavy-duty motor reversing switch for electric cars, golf carts, ATVs, quads, go-karts, rickshaws, small work trucks and other small to medium size electric vehicles. The dimensions of this switch including the handle are 5" high x 3" wide x 4" deep. Three position switch has reverse (left), neutral (center), and forward (right) positions. Selector handle is removable for panel mount installation. 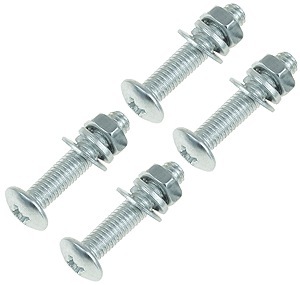 Wire terminal mounting screws are 5mm and work with #10 ring terminals. This is the same type of forward/reverse switch found on many electric golf carts, rickshaws, and work trucks. Rated for DC motors 5000 Watts and under. Wiring directions and mounting information for this switch are available below. Heavy-duty motor reversing switch for electric cars, golf carts, ATVs, quads, go-karts and other small to medium size electric vehicles. 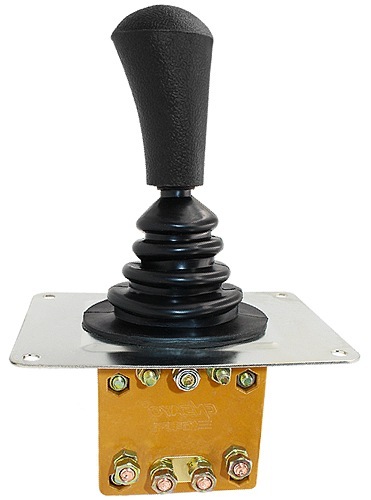 This is a full size automotive gear shift style vehicle direction switch which stands over 7-1/2" tall from top to bottom. Three position shift lever has reverse, neutral, and forward positions. Wire terminal mounting studs are 6mm. Rated Voltage 12-110V DC. Rated continuous current 85 Amps. Wiring directions for this switch are available below and dimensions are listed on the PDF file. 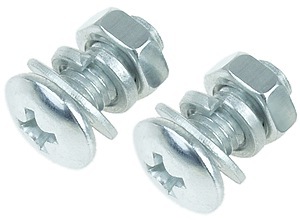 Set of two 5mm OD x 12mm long zinc plated steel pan head machine screws with flat washers, lock washers, and nuts. Recommended drill bit size is 13/64" or 5mm. For mounting reverse switch item # SWT-715 onto panels up to 1/8" thick. 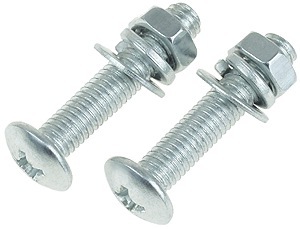 Set of two 5mm OD x 25mm long zinc plated steel pan head machine screws with flat washers, lock washers, and nuts. Recommended drill bit size is 13/64" or 5mm. For mounting reverse switch item # SWT-715 onto panels up to 5/8" thick. 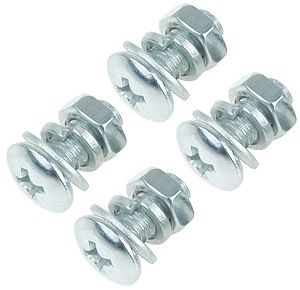 Set of four 6mm OD x 12mm long zinc plated steel pan head machine screws with flat washers, lock washers, and nuts. Recommended drill bit size is 1/4" or 6mm. For mounting reverse switch item # SWT-728 onto panels up to 1/8" thick. Set of four 6mm OD x 25mm long zinc plated steel pan head machine screws with flat washers, lock washers, and nuts. Recommended drill bit size is 1/4" or 6mm. For mounting reverse switch item # SWT-728 onto panels up to 5/8" thick. Crimp-on insulated ring terminal connector for 10-12 gauge wire. Ring has 4.3mm ID and accepts #8 or 4mm stud, machine screw, or bolt. 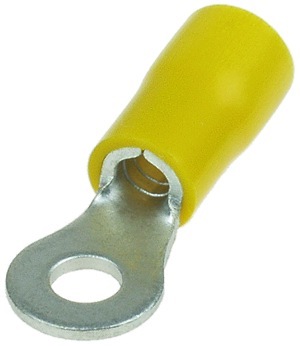 Crimp-on insulated hook terminal connector for 14-16 gauge wire. Ring has 4.3mm ID and accepts #8 or 4mm stud, machine screw, or bolt. 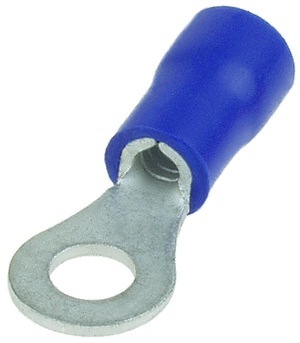 Crimp-on insulated ring terminal connector for 12-10 gauge wire. Ring has 5.3mm ID and accepts #10 or 5mm stud, machine screw, or bolt. Crimp-on insulated ring terminal connector for 16-14 gauge wire. Ring has 5.3mm ID and accepts 5mm or #10 stud, machine screw, or bolt. Crimp-on insulated ring terminal connector for 12-10 gauge wire. Ring has 6.4mm ID and accepts 1/4" or 6mm stud, machine screw, or bolt. Crimp-on insulated ring terminal connector for 16-14 gauge wire. Ring has 6.4mm ID and accepts 1/4" or 6mm stud, machine screw, or bolt.